*The Journey in Between: Thru-Hiking Solo on the Camino to Santiago by Keith Foskett. Price: Free. Genre: Travel, Literary, Travelers & Explorers, Excursion Guides, Adventurers & Explorers, Adventure, Hikes & Walks. Rated: 4.7 stars on 44 Reviews. 292 pages. ASIN: B005792XC2. New Clich?©s for the 21st Century: Zuckerisms (Cliches, Truisms, Expressions, Proverbs, Sayings) by Stephen Zuckerman, Top Pick, Stephanie Ericsson. Price: Free. Genre: Travelers & Explorers, Humor, Travel, Adventurers & Explorers. Rated: 4.3 stars on 7 Reviews. 134 pages. ASIN: B01BSAYF56. Berlin: The Best Of Berlin For Short Stay Travel (Berlin Travel Guide,Germany) (Short Stay Travel – City Guides Book 11) by Gary Jones. Price: Free. Genre: Germany, Cities, Arts & Photography, Travel, Tourist Destinations & Museums, Berlin, Budget Travel. Rated: 4 stars on 8 Reviews. 65 pages. ASIN: B0130ODR1Q. Posted on April 30, 2016 Author KibetCategories Budget, Free Travel Kindle Books, TravelersLeave a comment on Kindle Travel Deals for Saturday! Travel Greece: A Tourist’s Guide on Travelling to Greece; Find the Best Places to See, Things to Do, Nightlife, Restaurants and Accomodations! (Includes Travel Guides; Athens, Rhodes, Kos, Heraklion) by Sarah Stone. Price: Free. Genre: Athens, General, Rhodes, Hotels & Inns, Travel, Greece. Rated: 4.8 stars on 5 Reviews. 45 pages. ASIN: B01DX544K0. Posted on April 28, 2016 April 29, 2016 Author KibetCategories Free Travel Kindle Books, TravelersLeave a comment on Kindle Travel Deals for Friday! *Women with Wanderlust: A Guide to Roaming by Melissa D. Jones. Price: Free. Genre: Women, Travelers & Explorers, Budget Travel, Biographies & Memoirs, Travel, Solo Travel. Rated: 5 stars on 15 Reviews. 84 pages. ASIN: B01AU4KQ3Q. *The Post Grad Party: How to Travel the World, Get Paid & Teach by Brent Danis. Price: Free. Genre: Language Arts, Reference, Business Travel, Education & Reference, Travel, Pedagogy. Rated: 5 stars on 36 Reviews. 55 pages. ASIN: B00NG63XUE. Dummies’ Guide to Survival: Tactics, Mindset and Tips by Alex Pitt. Price: Free. Genre: Instructional, Camping, Sports & Outdoors, Reference, Travel. Rated: 4.6 stars on 5 Reviews. 24 pages. ASIN: B0182SJ7EQ. Posted on April 26, 2016 April 26, 2016 Author KibetCategories Biographies, Budget, Free Travel Kindle Books, memoir, TravelersLeave a comment on Kindle Travel Deals for Tuesday! *Norway: Norway Travel Guide, The Perfect Guide Book for Norway (Norway, Norway Travel Guide, Scandinavian Travel Guide, Olso Travel Guide, Trondheim Travel Guide, Tromsø Travel Guide, Norway) by Norway Travel Guides, Scandinavia Travel Guides. Price: Free. Genre: Scandinavia, Tourist Destinations & Museums, General. Rated: 4.8 stars on 20 Reviews. 194 pages. ASIN: B01E42XOMA. Istanbul in 3 Days: The Definitive Tourist Guide Book That Helps You Travel Smart and Save Time (Turkey Travel Guide) by Finest City Guides. Price: Free. Genre: Travel, General, Istanbul, Budget Travel, Tips, Specialty Travel, Middle East, Turkey. Rated: 4.8 stars on 6 Reviews. 31 pages. ASIN: B019L4N7T6. Posted on April 25, 2016 Author KibetCategories Budget, Free Travel Kindle Books, TravelersLeave a comment on Kindle Travel Deals for Monday! *France: Finest Tourist Guide! Perfect For Sightseeing, Shopping, Restaurants, And The French Culture (French, French Language, Travel, Learn French) by Daxton Wood. Price: Free. Genre: Travel, French, France, Nonfiction, General, Air Travel, Tips. Rated: 4.5 stars on 11 Reviews. 18 pages. ASIN: B00S8I3EYU. New York in 3 Days: The Definitive Tourist Guide Book That Helps You Travel Smart and Save Time (USA Travel Guide) by Finest City Guides. Price: Free. Genre: Northeast, Travel, Budget Travel, General. Rated: 4.6 stars on 5 Reviews. 32 pages. ASIN: B017UJ083M. Posted on April 22, 2016 April 24, 2016 Author KibetCategories Budget, business, Free Travel Kindle Books, TravelersLeave a comment on Kindle Travel Deals for Sunday! The Encyclopedia of Cheap Travel: Save Up to 90% on Lodging, Flights, Tours, Cruises, and More! by Terrance Zepke. Price: Free. Genre: Education & Reference, General, Budget Travel, Reference, Tips. Rated: 4.4 stars on 5 Reviews. 296 pages. ASIN: B005WKGNKY. Posted on April 21, 2016 Author KibetCategories Budget, Free Travel Kindle Books, TravelersLeave a comment on Kindle Travel Deals for Thursday! ***The War of the Worlds by H. G. Wells. Price: Free. Genre: Classics, Adventure, Travel. Rated: 4.5 stars on 504 Reviews. 124 pages. ASIN: B01C54MINK. *The Smuggler’s Promise: Based On A True Story by Rufus Hylton. Price: Free. Genre: Travelers & Explorers, True Crime, Travel, Adventurers & Explorers. Rated: 4.9 stars on 21 Reviews. 327 pages. ASIN: B012YS1J6Y. Posted on April 20, 2016 Author KibetCategories Free Travel Kindle Books, TravelersLeave a comment on Kindle Travel Deals for Wednesday! 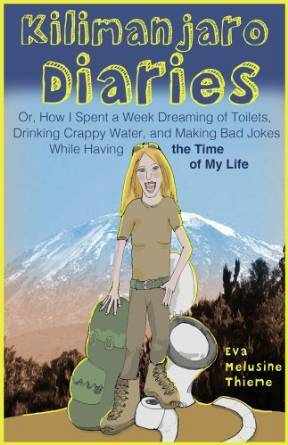 **Kilimanjaro Diaries: Or, How I Spent a Week Dreaming of Toilets, Drinking Crappy Water, and Making Bad Jokes While Having the Time of My Life (Deal, Not Free) by Eva Melusine Thieme. Price: $0.99. Genre: Memoirs Deal of the Day, Sponsor, Adventure, Africa, Travel Writing, Essays & Travelogues, Travelers & Explorers, Adventurers & Explorers. Rated: 4.5 stars on 68 Reviews. 259 pages. ASIN: B00JAGJ7T0. Reviewers love it: A super read! It made me laugh out loud at times! The book is very well written in a humorous and honest way with little snippets of historical information about Mt. Kilimanjaro and if famous climbers. Delightful! More than a wry account of a challenging trek! *Portuguese: Learn Portuguese In 10 DAYS – Effective Course to Learn the Basics of the Portuguese Language Fast by Ashley Rashford. Price: Free. Genre: Portuguese, Brazil, Reference, General, Travel. Rated: 4.6 stars on 11 Reviews. 83 pages. ASIN: B01DUB9UAQ. *German: German In 10 DAYS! – Effective Course to Learn the Basics of the German Language FAST by Ashley Rashford. Price: Free. Genre: German, Germany, Travel, Reference. Rated: 4.6 stars on 10 Reviews. 84 pages. ASIN: B01DUAP9UW. SYDNEY TRAVEL GUIDE: The Ultimate Tourist’s Guide To Sightseeing, Adventure & Partying In Sydney (Sydney Travel Guide, Australia Travel Guide) by Wanderlust Readers. Price: Free. Genre: Australia & South Pacific, General, Sydney, Road Travel, Auto & RV Travel. Rated: 4.8 stars on 5 Reviews. 129 pages. ASIN: B015VQCET2. Japanese: Japanese In 10 DAYS! – The Ultimate Course to Learning the Basics of the Japanese Language In No Time by Ashley Rashford. Price: Free. Genre: Travel, Japanese, Japan, Reference, General. Rated: 4.7 stars on 7 Reviews. 38 pages. ASIN: B01DUA29SM. Posted on April 19, 2016 Author KibetCategories $1 Travel deals, Biographies, Free Travel Kindle Books, history, memoir, TravelersLeave a comment on 5 Awesome Free Kindle Travel Books for Tuesday! Five Star Recipes from World Famous Hotels & Resorts (Linda Lang’s Taste of Travel Book 1) by Linda Lang. Price: Free. Genre: Entertaining & Holidays, Dining, Special Occasions. Rated: 4.5 stars on 6 Reviews. 132 pages. ASIN: B01E7ROYUS. Posted on April 18, 2016 Author KibetCategories Free Travel Kindle Books, TravelersLeave a comment on Kindle Travel Deals for Monday! $1 Informative Family Travel Diary Deal! *Diary of A Traveling Kid: The True Life Adventures of Two Tweenage American Boys Living in Europe by James O’Leary, John O’Leary, Julie O’Leary, Stephen O’Leary. Price: $0.99. Genre: Family Travel Deal, Sponsor, Children’s Travel. Rated: 5 stars on 5 Reviews. 288 pages. ASIN: B01CDKRNIG. Reviewers love it: I really enjoyed this fascinating story of two teens who chronicled their way along their vast travels! A wonderful story and a wonderful family! I just loved the honest feedback on the sites that this family had visited! Super fun and easy to read! *Destination Dachshund: A Travel Memoir: Three Months, Three Generations and Sixty Dachshunds by Lisa Fleetwood. Price: Free. Genre: Parenting & Relationships, Grief & Bereavement, Travel, Death & Grief, Western Europe, Specialty Travel, Breeds, Travel with Pets. Rated: 4.9 stars on 28 Reviews. 216 pages. ASIN: B01E3VZ80I. Posted on April 17, 2016 Author KibetCategories $1 Travel deals, Free Travel Kindle Books, memoir, TravelersLeave a comment on Kindle Travel Deals for Sunday!